If you’re at all aware of the Skarsgård acting dynasty, you know Stellan and My Agnes have quite the talented family; their sons Alexander, Gustav (Vikings), Bill (Hemlock Grove) and Valter (Black Lake) have all followed in dad’s footsteps. In advance of the release of Stephen King’s It (2017) and Atomic Blonde and Mute, each of which stars a Skarsgård brother, respected “journalist” Alexander had an on the record conversation with Bill for Interview magazine. Their easy banter is both funny and unexpectedly moving, as they discuss Bill’s introduction to showbiz by his big brother, and the younger sibling’s thoughts on terrifying children. I highly recommend reading the full piece when you get a chance, but following are my favorite excerpts. The first comes from Alexander’s memory about Bill at 9 years old. Having finished shooting his part as Klasse in White Water Fury, Bill was taken back to the hotel while Alex finished his last scene. The second story will snap you right out of your tears. If you haven’t yet seen the terrifying trailer for It — Bill plays Pennywise, the iconic clown role originally played by Tim Curry — you should definitely check it out. As any King or Curry fan knows, Pennywise is the most horrific of clowns, and he has an affinity for children. Alexander asked Bill how he felt knowing he’s going to cause nightmares in kids “for decades to come”. It is in theaters September 8th; Atomic Blonde, July 28th; Mute, later this year. 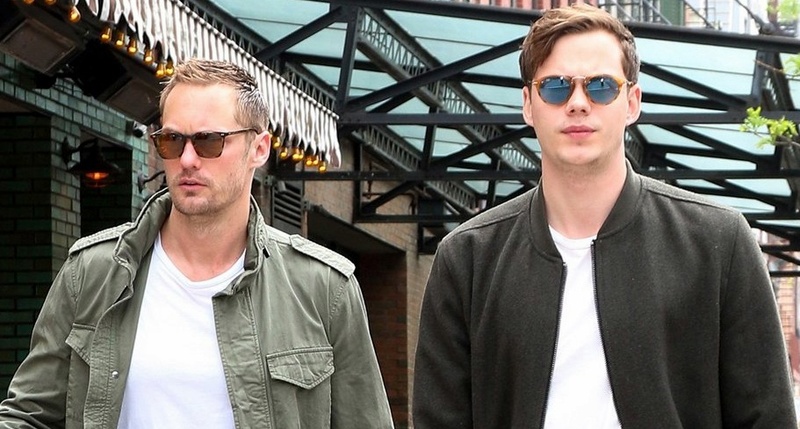 Tags: Alexander and Bill SkarsgårdAlexander and Bill Skarsgård brothersAlexander SkarsgardAtomic BlondeBill and Alexander SkarsgårdBill SkarsgårdInterview magazineItIt 2017MutePennywiseStellan SkarsgårdStephen KingStephen King ItWhich Skarsgård brother is Pennywise?Which Skarsgård stars in It?